Going to kick-off this report with a wee advert for the Crask Inn. 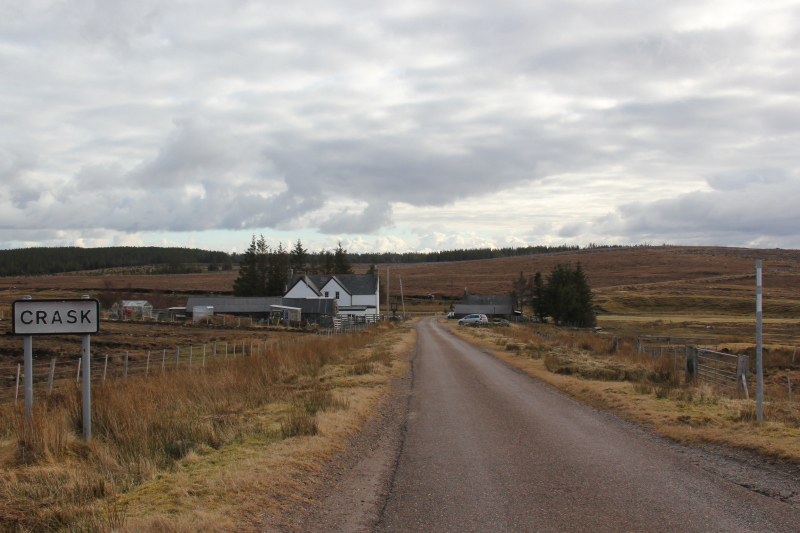 The Crask Inn is a small inn located on the A836, between Lairg and Altnaharra. The inn has four rooms, a bunkhouse and a lawn that can be used for camping. The inn is very dog-friendly. Don’t expect four or five star luxury, don’t be surprised if the electric goes off and don’t expect television or wi-fi. So what makes the Crask Inn so special? It is a classic walker’s pub offering great hospitality. The owners, Mike and Kai, really go out of their way to make you feel most welcome. 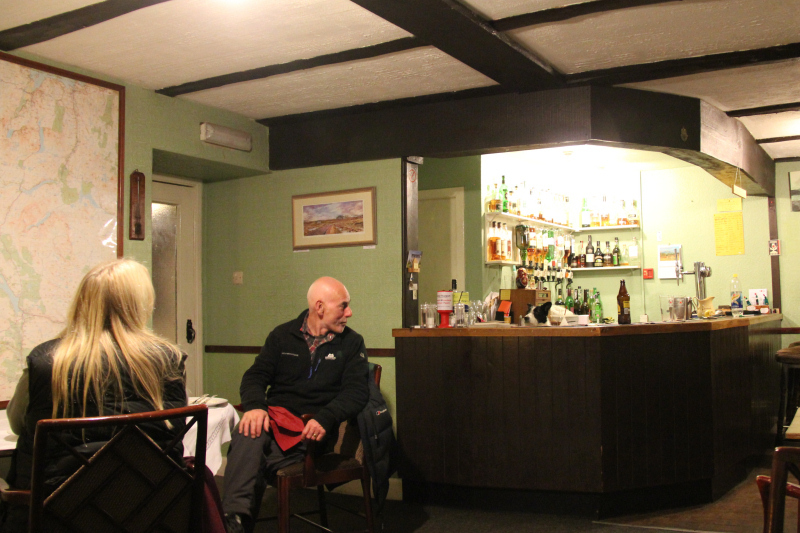 The food in the Crask Inn is also fantastic – home cooked, very reasonably priced and really tasty. If you have hills to do in the area please come and stay here, or at least pop in past for some food and drinks. The Crask Inn doesn’t have a website, only a telephone: 01549 411241. 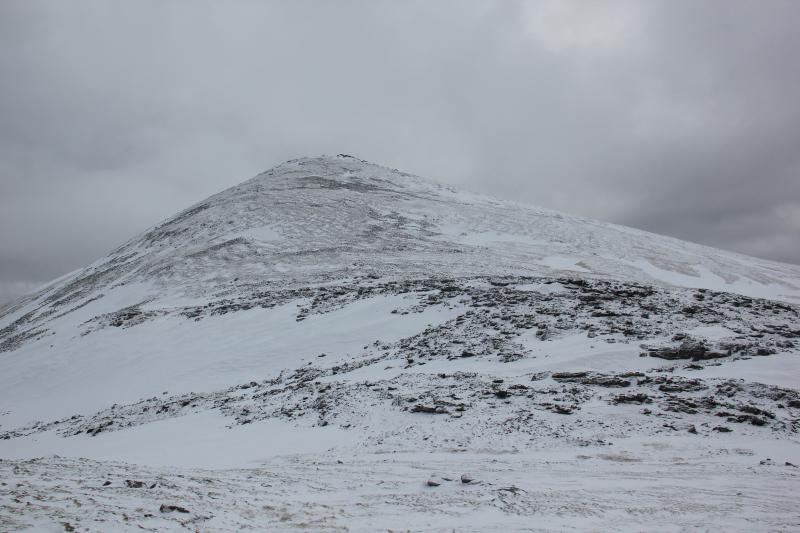 I last ascended Ben Klibreck in October 2002 via the standard route from Vagastie. My log from 2002, describes the lower section of the Ben Klibreck as “a bogfest”. 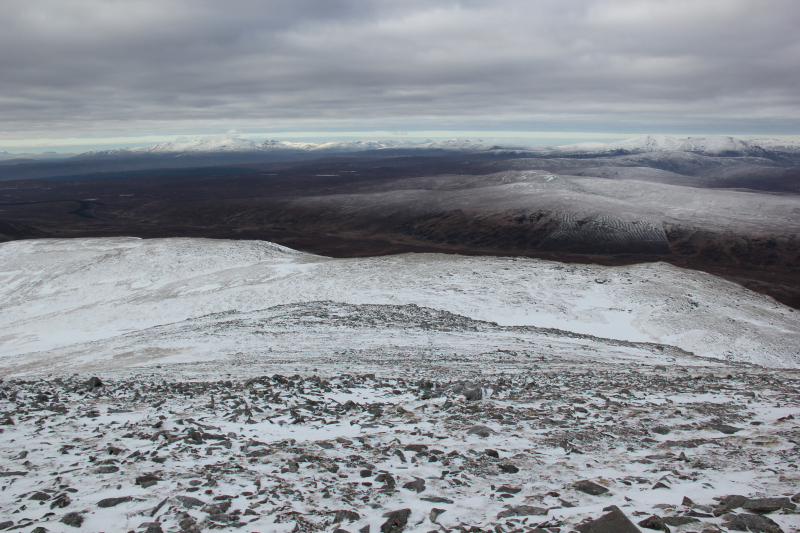 For my second ascent, I opted to start walking from the Crask Inn. 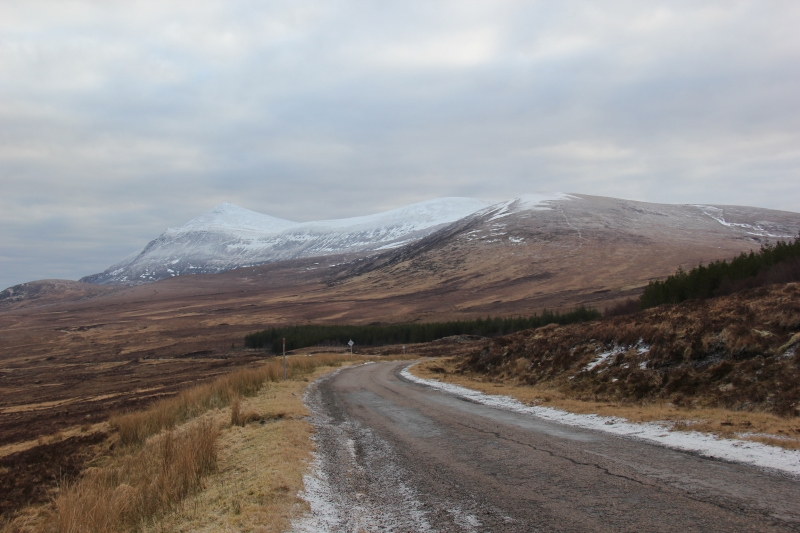 After walking circa 3km along the A836, I left the road at the start of a vehicle track which takes you to the summit of Cnoc Sgriodain and beyond. 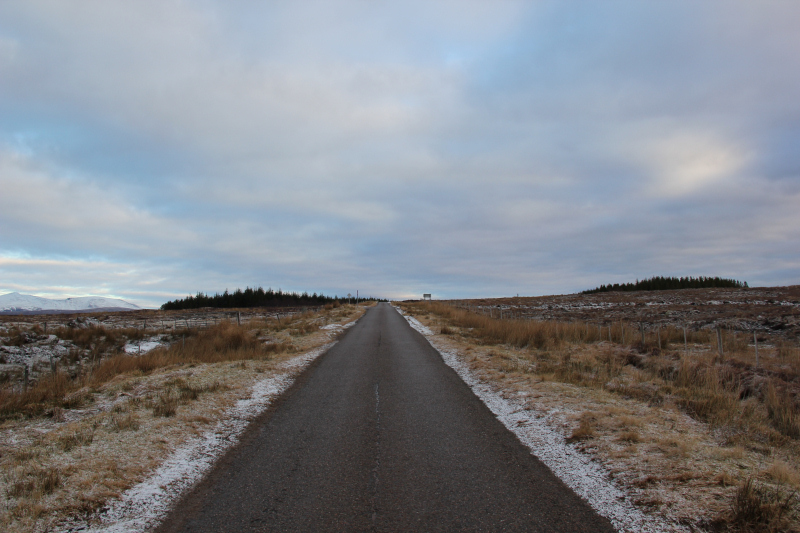 The vehicle track starts a short distance before the bridge over the Allt a’Chraisg. 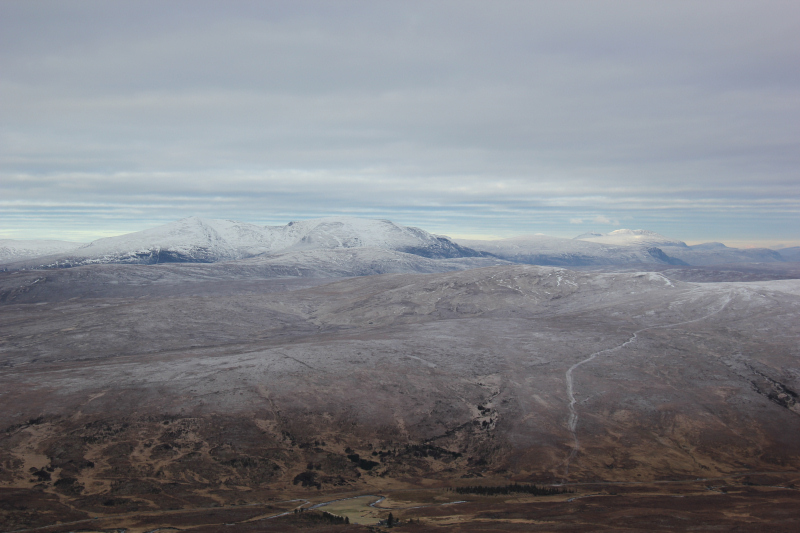 During the ascent of Cnoc Sgriodain, I got good views across to Ben Loyal, the Queen of Scottish Mountains. 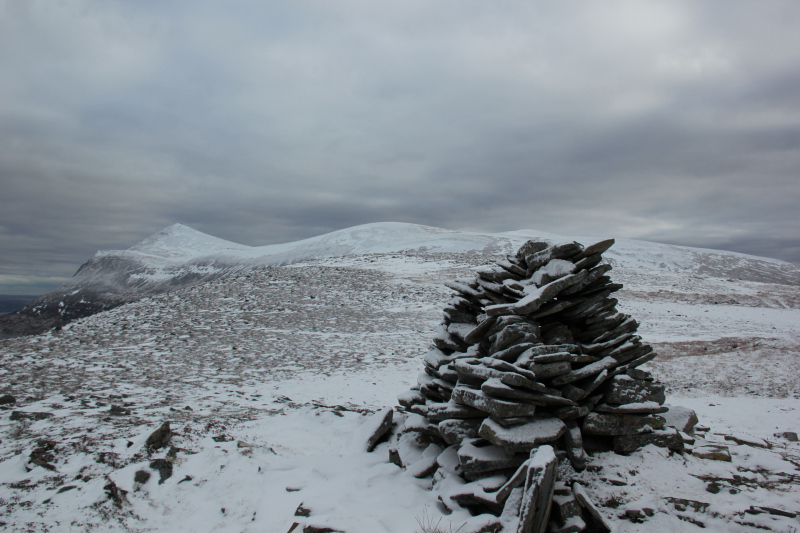 Just over forty minutes after leaving the road, I reached the first of two large cairns on Cnoc Sgriodain. 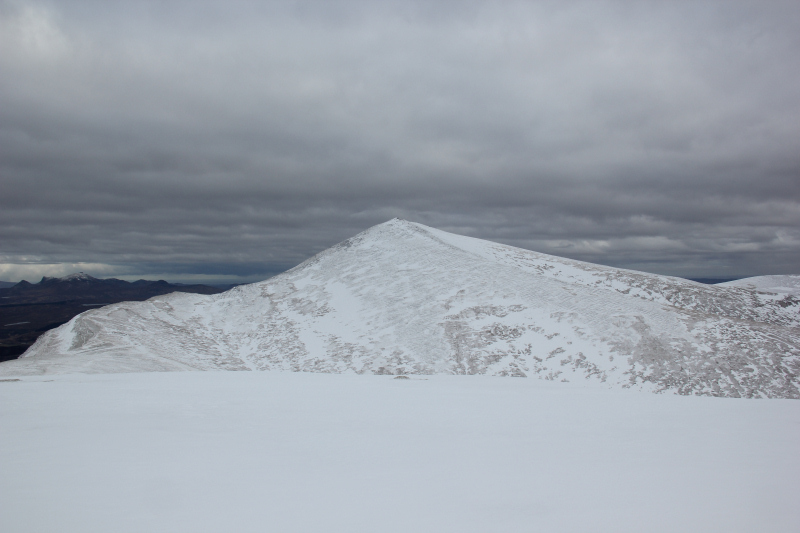 The summit of Ben Kilbreck still looked a fair distance off. 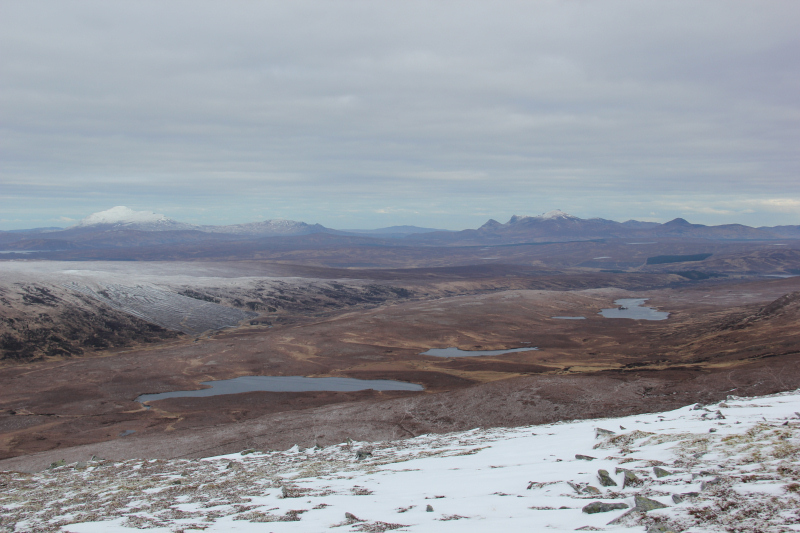 At the summit of Cnoc Sgriodain, I took a photo of Ben Hope which I had ascended the day previous. 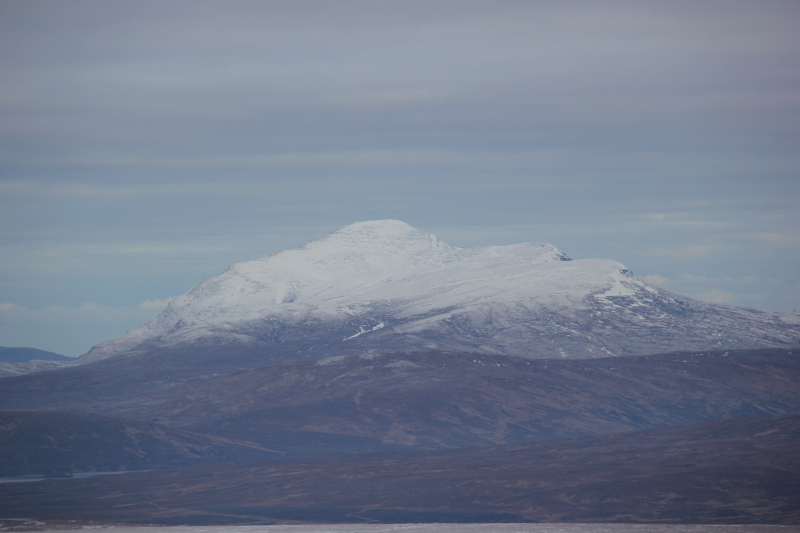 The snow covering Ben Hope had fallen in the past 24 hours. 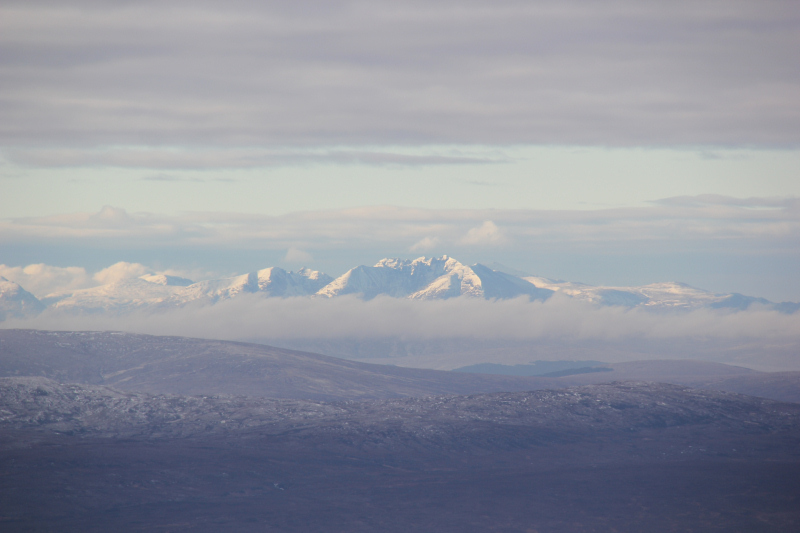 The next photo shows the view across to Ben Hee from Cnoc Sgriodain. 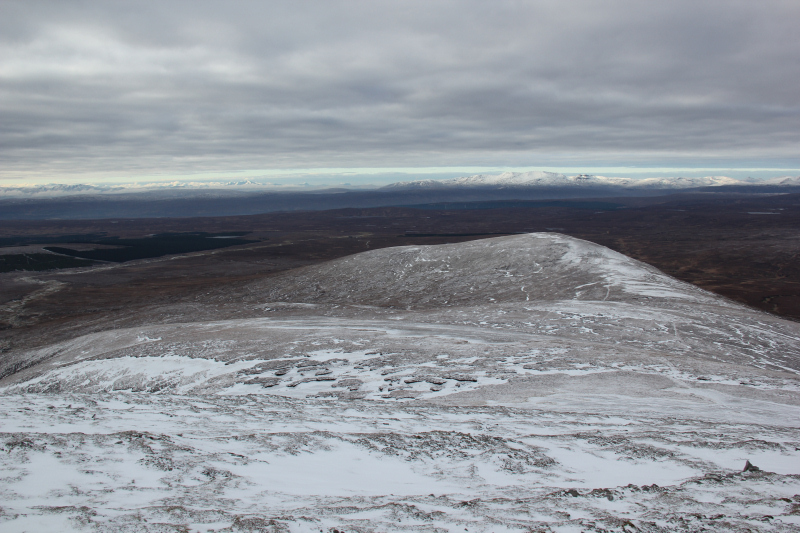 A windfarm company intends erecting 38 @ 125m wind turbines right across the area shown in the next photo. 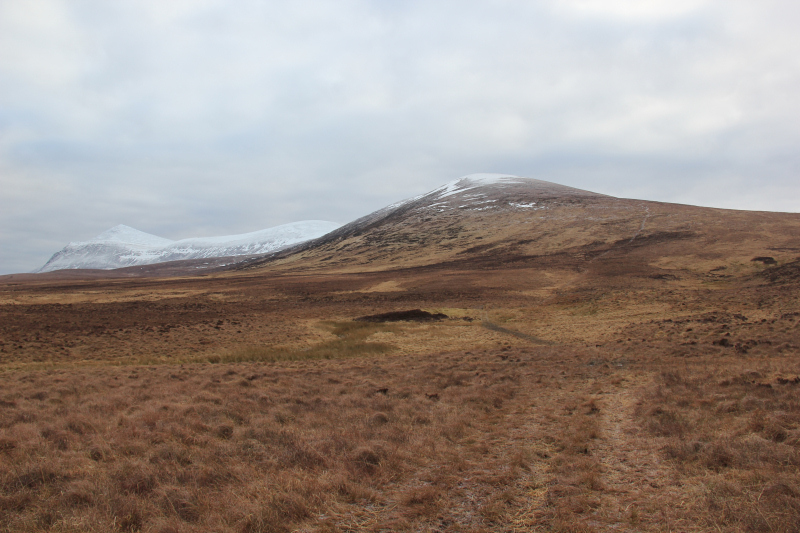 The windfarm is known as the “Creag Riabhach windfarm”. 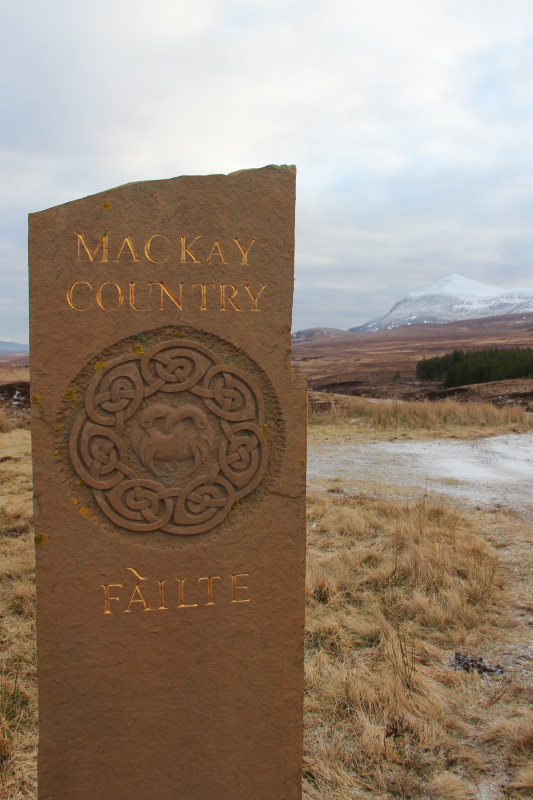 Please, please, please object to the vandalism of this scenic land. 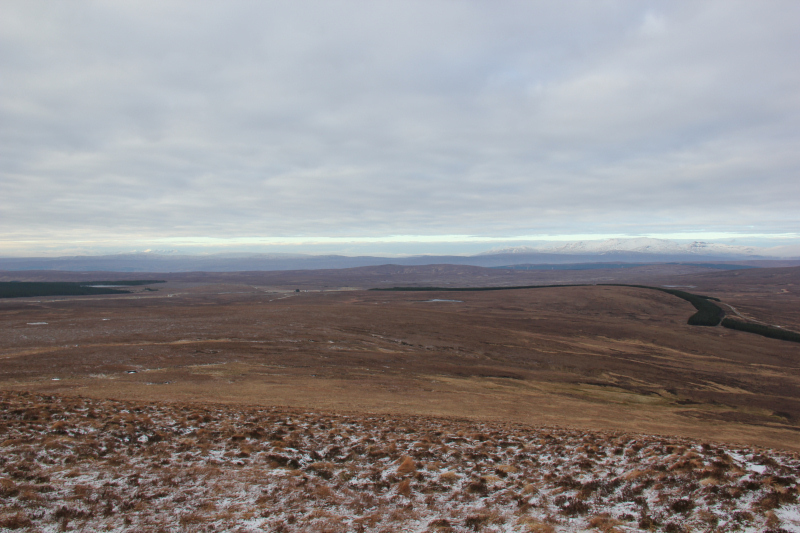 The locals do not want a windfarm here. Great to see that the MCofS have already responded to a scoping exercise recommending that this windfarm should not go ahead. 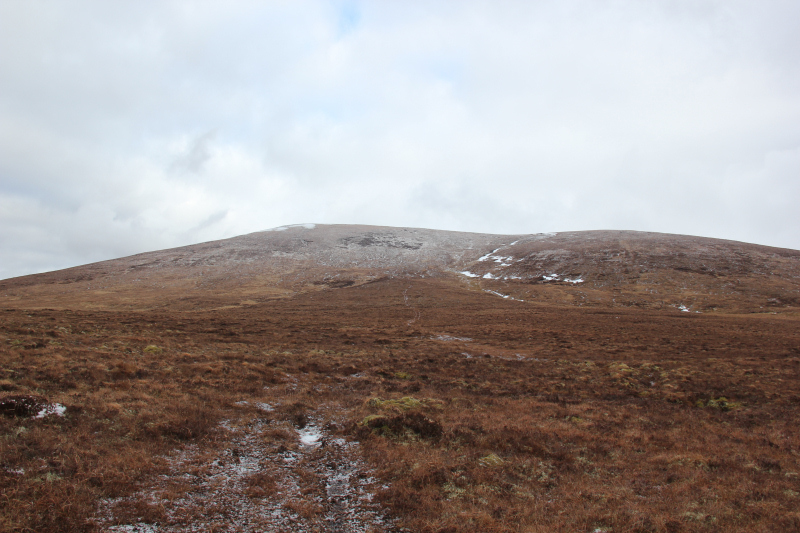 From Cnoc Sgriodain, I made my way across to A’Chaoirnichain, which is just marked as 808m on the 1:50000 Landranger map. 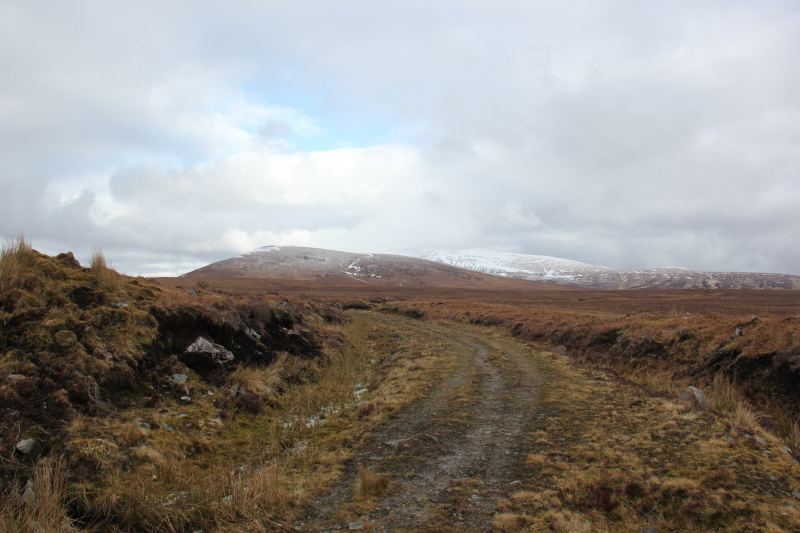 A’Chaoirnichain is a HuMP - Hundred Metre Prominence hill. 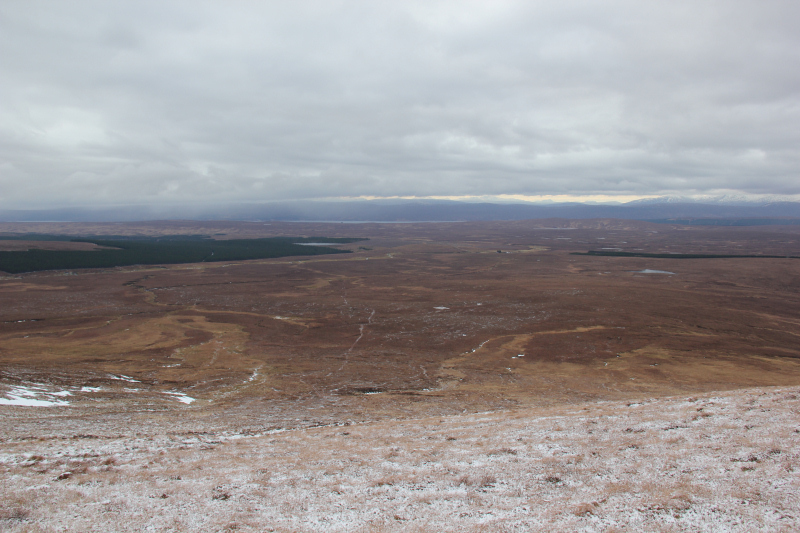 I was really impressed with the views during the ascent of A’Chaoirnichain. The air clarity was superb. 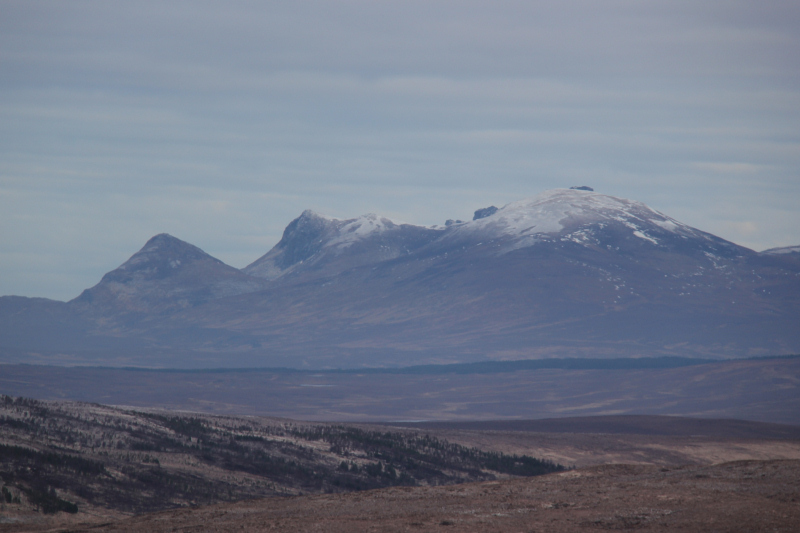 In the distance I think I could make out An Teallach. 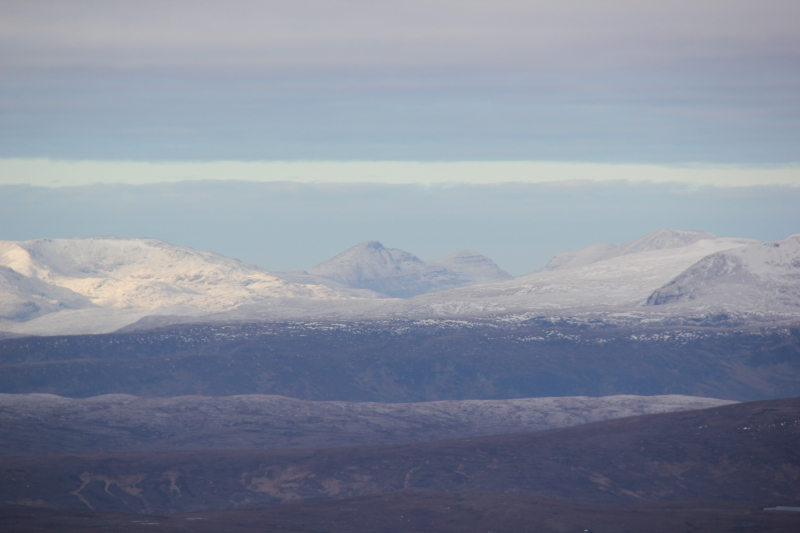 I also think I could see Suilven beyond Ben More Assynt. 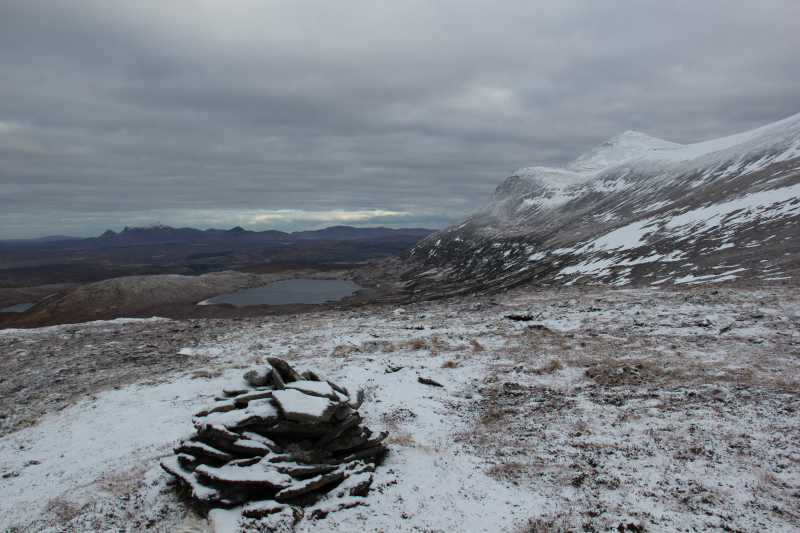 By the time I reached the summit of A’Chaoirnichain there was more snow than I had expected. On A’Chaoirnichain I found the remains of broken Yaktrax ice grips which made me think why wear this rubbish up a hill – they are not crampons. 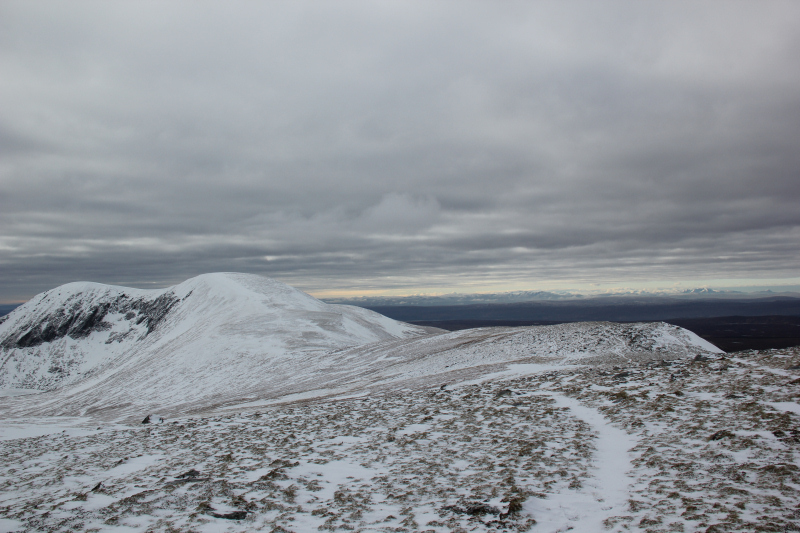 As I made my way up the final section of Ben Klibreck, I could see a walker at the summit starting his descent. 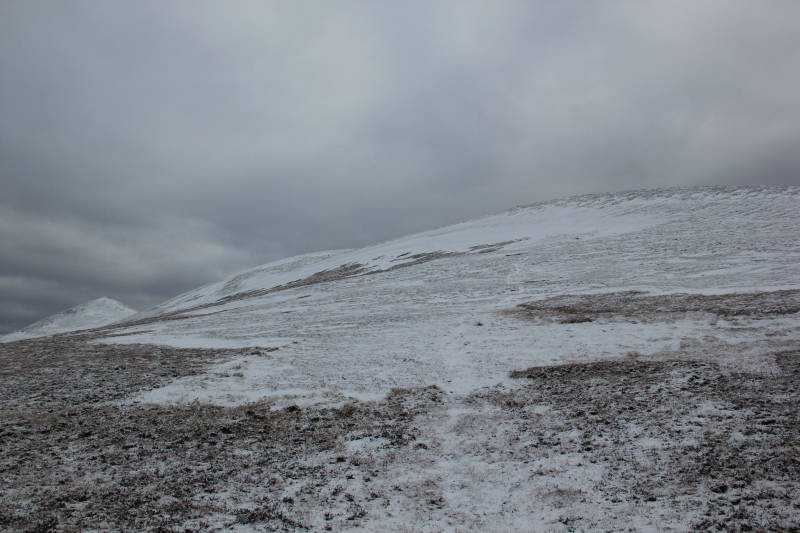 I followed his tracks during my ascent but didn’t meet him on the way up. It was just my luck that circa ten minutes before reaching the summit, low cloud started to cover the summit. On reaching the summit, we didn’t hang around for long before descending via the same route. 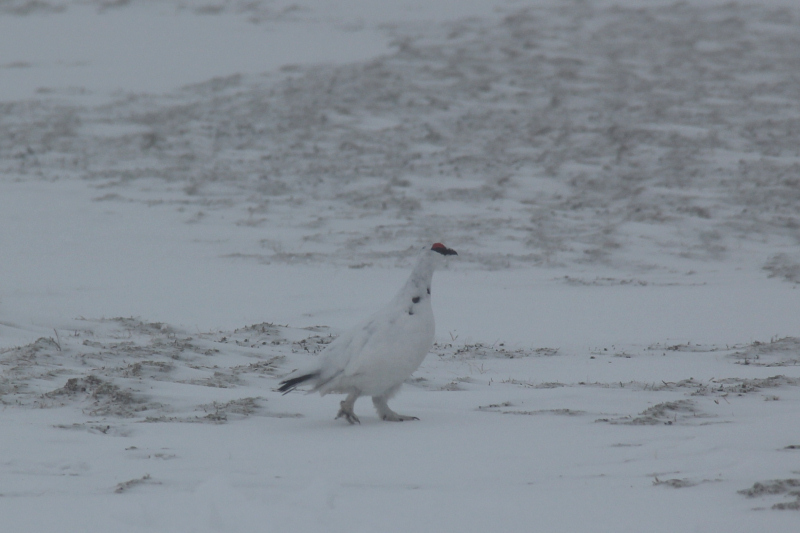 During the walk back to A'Chaoirnichain, I spotted a couple of ptarmigan. 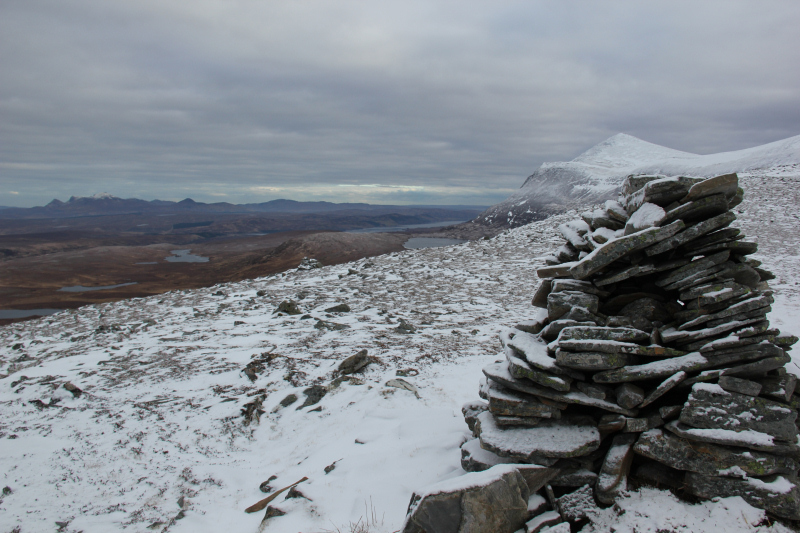 From A'Chaoirnichain I returned to the summit of Cnoc Sgriodain and then decided to head directly back towards the Crask Inn instead of returning via the A836. During the descent, I made for a vehicle track at the bottom of the hill. On reaching the vehicle track I followed it until it simply disappeared. Beyond the vehicle track the ground was fairly unpleasant. 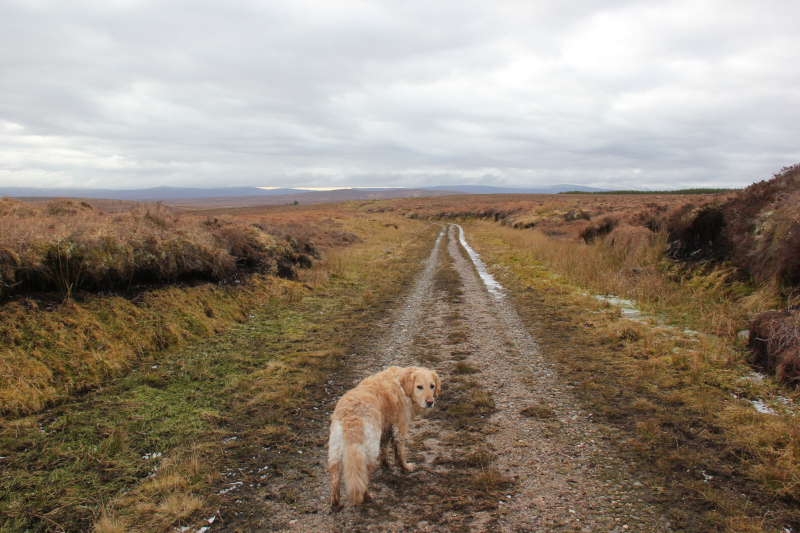 After covering circa 1km of trackless boggy terrain I reached the wide vehicle track leading back towards the Crask Inn. 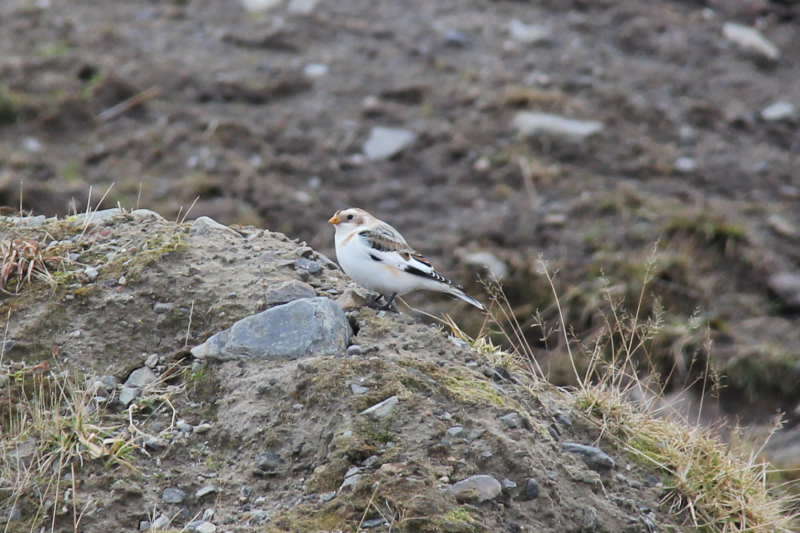 A short distance before reaching the Crask Inn, I stopped to photograph a Snow Bunting. 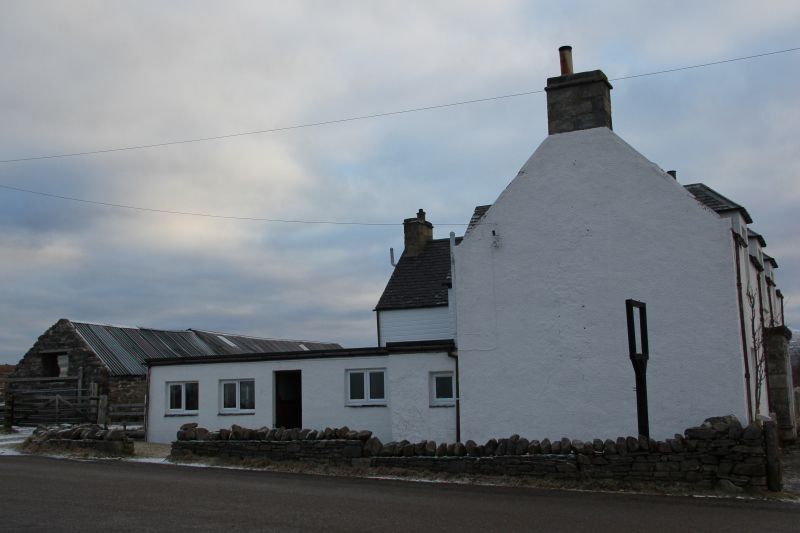 Was great to get back to the Crask Inn and head to the bar for a pint and a heat from the wood-burning stove. 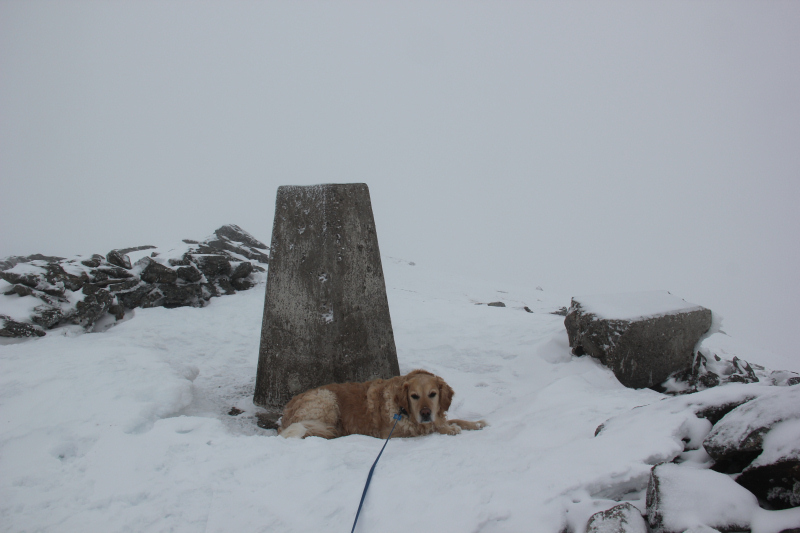 Beinn was glad to get back to as he was knackered .